Tiger Bill Reviews Erskine Method for Drumset DVD by Peter Erskine from Alfred Publishing. 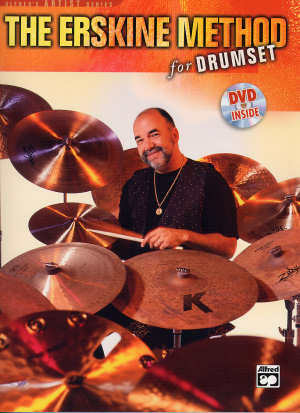 Peter Erskine, one of the most respected drummers of all time, shares his methods in this combo book and DVD aimed at beginning and advanced players alike. Let's check it out. The Drumset. Explains the parts of the basic drumset. The Hands. Includes holding and using the sticks, and traditional and matched grips. Elements of Music. Reading rhythmic notation. Mechanics. The basic stroke and rebound. The Rudiments. Eleven basic rudiments. Rhythmic Styles. Explanation of "Swung" versus "Straight" eighth note feels. 12 Things to Remember. Peter lists a dozen tips. Setting Up. Arranging the drumset for comfort and control. Includes bass drum playing (heel up and heel down) and hi-hat technique. Beats and Exercises. Simple beats, eighth note beats, sixteenth note beats, applying the ride cymbal, and swung eighth note beats. Play-Along Examples. This section of the book points you to four tracks on the accompanying DVD, three of which are designed to help you apply the beats covered in the previous chapter to music. The fourth track corresponds to a drum chart in the book with Peter demonstrating his version and providing a version minus the drums for play along. Tempos and Subdivisions. Working with various tempos from slow to fast and applying the swing feel. Fills. Examples of fills and where to play them in the context of a song. Comping. Various exercises and techniques used for comping in jazz, rock, pop, and funk styles. Solos. Includes song structure, dynamics, and soloing techniques. Ensemble Playing. Approaches to both small and large groups. Reading. Discusses ensemble figures, interpreting written music, and includes three drum charts for play-along practice. Brushes. Jazz styles are covered along with sweeping exercises, fast tempo techniques, brush/stick combinations, and a drum chart for play-along. Phrasing Suggestions for Brazilian Musics. Bossa Nova, Baião, and cross-stick suggestions. Grouping in 2s and 3s. Jazz Waltz beats, Elvin Jones style grooves, and rhythmic groupings in 4/4. Includes a drum chart for play-along practice with the DVD. The Erskine Method Rules. A page of tips and advice from Peter. The Erskine Method DVD Menu. Contents of the DVD. This combo packs a lot of information into a 96-page book and a DVD that's just over 2 1/2 hours long. The material is useful to drummers of all levels. Beginners will learn a lot about reading and interpreting drum charts that would take years of trial and error to learn on their own, and intermediate and professional players lacking in solo skills, comping, brush technique, or drum chart interpretation can pick up lots of valuable information and practical skills from this combo, thanks to the play-along audio tracks on the included DVD. Although the book and DVD are available separately, I strongly recommend purchasing the pair together as they form a powerful combination that I recommend to all drummers whose profile match any of the above.